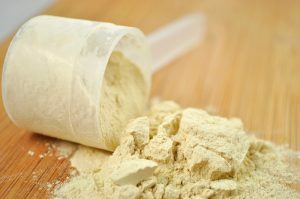 What is PHUL workout and how it works? PHUL workout program is a great transition workout to gain more strength and muscle gains like never before by using your knowledge of your own body. The term PHUL is the short form of Power Hypertrophy Upper Lower. Basically PHUL workout routine is developed for increasing strength along with maximizing muscle hypertrophy. In simple words PHUL workout combines size and strength. Since it is a strength oriented training program, you will hit more muscles than any other training program. That is, the primary focus of PHUL workout routine is mainly on compound lifts. PHUL workout routine is an upper/lower split program. Here we split workout days into two upper body exercises and lower body exercises. 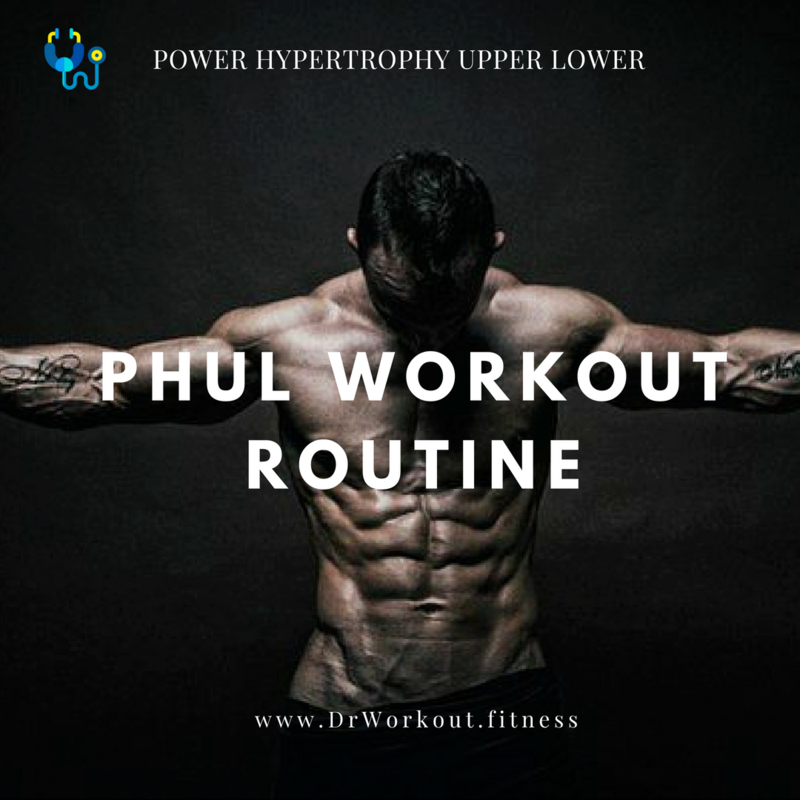 PHUL workout program consist of 4 workout days, 2 of its workout days are for pure strength gain and the remaining 2 are for muscle hypertrophy. Power Hypertrophy Upper Lower Program follows a very high frequency training mode because of that we can keep our muscles in anabolic state throughout the week. 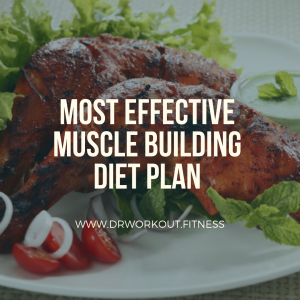 Muscle gain is primarily based on the total work done, rather than volume, whereas strength is primarily based on progressive overload. This means, training with 100lbs x 15 reps for hypertrophy is equivalent to lifting 150lbs x 10 reps. If you considered only about strength gain, then 150lbs x 10 reps is more useful. During hypertrophy day you need very less warm up and rest time to do the 100lbs x 15 reps and you will get the same or more work in in a shorter period, then you can focus more on progressive overload for strength gains on the power days. Compared to strong lifts 5×5, 5/3/1 training programs for strength gains, PHUL program will help you to gain strength along with better size gains because of the extra work. In a training regimen frequency refers to how many times a week you do strength training to a particular muscle group. PHUL program is a 4 day upper/lower split program, because of upper/lower split we can train each muscle group two times per week. 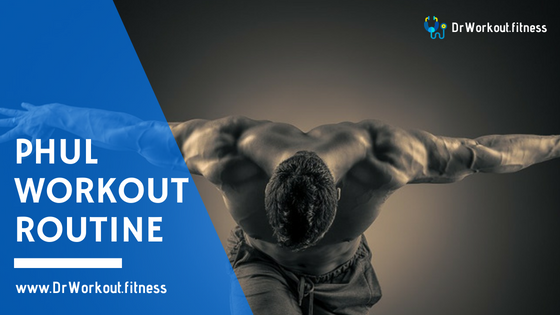 Recent scientific studies confirmed that muscle protein synthesis/anabolic state of muscle remain elevated for up to 48 hours after training. Power hypertrophy upper lower program designed in such a way that you will train same muscle groups after 48 hours. That is you can keep muscles in anabolic state throughout the week. The focus of PHUL program is to increase optimal performance on main compound lifts and pack maximum muscle. PHUL workout is developed by combining the basics of strength oriented programs and muscle hypertrophy oriented programs. The main objective of PHUL program is gaining maximum strength by enhancing muscle hypertrophy. The only way to achieve this optimal progression is heavy compound lifts. Isolation workouts are also included in the program to improve compound lifts by maximizing muscle hypertrophy. The Power hypertrophy upper lower program reserves 2 of its training days for pure strength gaining. By progressive over loading and increasing time under tension you can increase your strength. When you get stronger, lift more heavy weights, push yourself to the extreme. On strength days you should do 3-4 sets of 3-5 reps of 80-95% of your 1 rep max for the compound lift. The remaining 2 days of PHUL workout plan is reserved for muscle hypertrophy oriented training. The goal of muscle hypertrophy days is to pack maximum muscle and mass. In hypertrophy days you will focus on bodybuilding style training. That is, you will perform more isolation movements in hypertrophy days. On hypertrophy days you should do 3-4 sets of 10-15 reps of 60-80% of your 1 rep max. In PHUL routine the priority has given to compound lifts. Compound lifts should remain unchanged. However you are free replace or insert new isolation movements to the program. In the beginning of PHUL routine it is recommended to start with lower volume. Exercises with low reps should be done with heavy weights and exercises with higher reps should be completed with lite weights. You should struggle but set your weight cleverly. In traditional bodybuilding style failure is a vital component to maximize the effect of each set. But overusing this technique will harm your results. 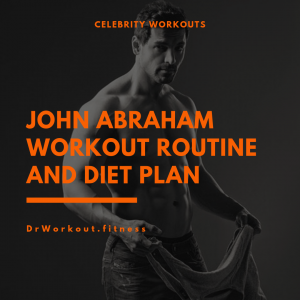 All sets should be completed in proper form with the ability to do 1 more rep.
Well defined core muscles are very essential for the aesthetic look. So we can’t exclude ab training. Ab exercises can be performed at the end of lifting section or on off days. 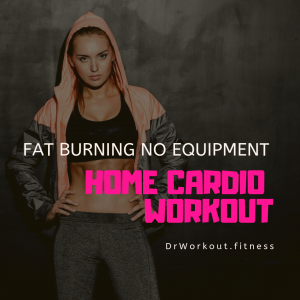 Each exercise have different intensity. 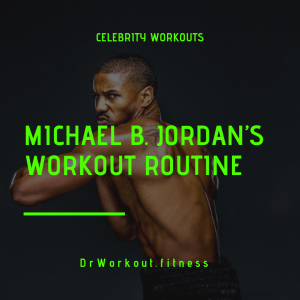 Based on the difficulty of the exercise you can pick your rest time. You can rest anywhere between 60-150 sec. You can use progression photos and mirror images to identify the muscle groups that are growing steadily and make a note of what is not growing. Based on the note you may add/replace isolation movements. Don’t be afraid to customize the original PHUL workout routine. Previous PostYoga Vs Gym for Weight Loss: Which is Better? I really need more strength so my question is, can I use all 4 days just for strenght. 4 sets and 5 reps on all excercises? 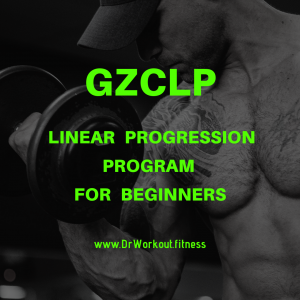 And after 4 weeks I start using Upper Hypertrophy and lower Hypertrophy ?